Little Women Louisa May Alcott Little Women is a novel by American author Louisa May Alcott (1832 1888), which was originally published in two volumes in 1868 and 1869. Alcott wrote the books rapidly over several months at the request of her publisher. The novel follows the lives of four sisters Meg, Jo, Beth, and Amy March detailing their passage from childhood to womanhood, and is loosely based on the author and her three sisters. 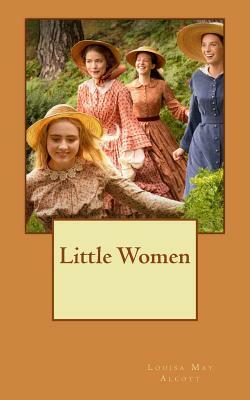 Little Women was an immediate commercial and critical success, and readers demanded to know more about the characters. Alcott quickly completed a second volume (entitled Good Wives in the United Kingdom, although this name derived from the publisher and not from Alcott). It was also successful. The two volumes were issued in 1880 in a single work entitled Little Women. Alcott also wrote two sequels to her popular work, both of which also featured the March sisters: Little Men (1871) and Jo's Boys (1886). Although Little Women was a novel for girls, it differed notably from the current writings for children, especially girls. The novel addressed three major themes: "domesticity, work, and true love, all of them interdependent and each necessary to the achievement of its heroine's individual identity.